The latest measures — outlined in a sweeping new anti-extremism legislation — take effect Saturday and come on the heels of a series of steps to increase surveillance in the region that include the surrender of passports and mandatory GPS trackers in cars. “They’re doubling down on security in Xinjiang,” said James Leibold, an associate professor at Australia’s Le Trobe University, whose research focuses on China’s Uyghur minority. 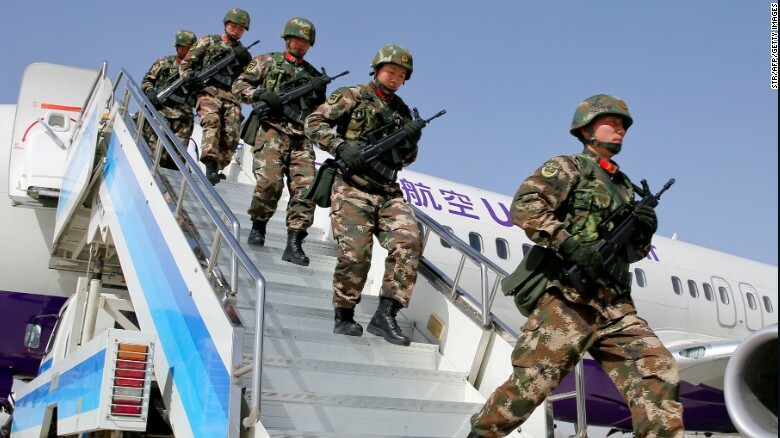 Chinese military police get off a plane to attend an anti-terrorist oath-taking rally in Xinjiang, on February 27. Why is China so concerned? Hundreds of people have been killed in Xinjiang in recent years; the government describes the perpetrators as terrorists inspired by religious extremism. There has been a spate of high-profile attacks involving ethnic Uyghurs, a Turkic-speaking minority, outside the province. These include a 2014 attack outside a rail station in the southwestern city of Kunming that killed 31 people, and an attack in Beijing in 2013 when a car drove into a crowd of tourists and killed five people. 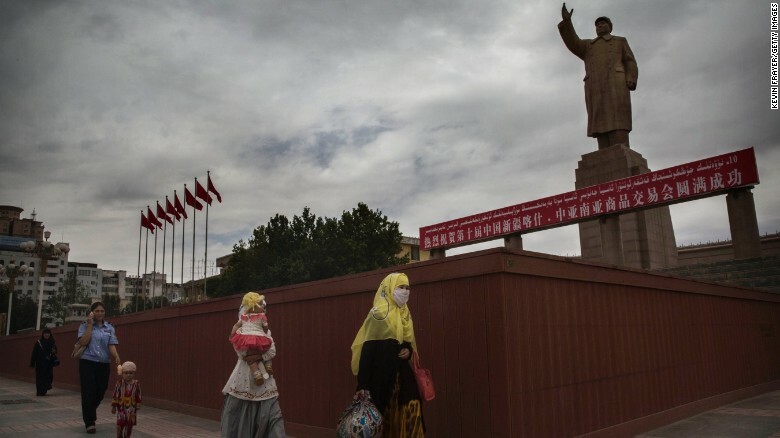 A veiled Muslim Uyghur woman walks passed a statue of Mao Zedong on July 31, 2014 in Kashgar, Xinjiang. In March, President Xi Jinping called for a “great wall of iron” to safeguard the region’s stability. Xinjiang, a resource-rich province, plays a key role in the “One Belt, One Road” initiative championed by Xi. The project aims to improve economic ties with central Asia and Xi wants no disruption to a landmark international conference he is holding on it in May. “We’d be foolish to deny that China has a problem with terrorists,” Leibold told CNN. An anti-terrorist oath-taking rally in Xinjiang in February. The Uyghurs are largely Muslims, who are the dominant ethnic group in Xinjiang, a large autonomous region that borders Russia, Mongolia, central and south Asia. Uyghurs regard themselves as linguistically, culturally and ethnically close to central Asia, despite a long history of Chinese rule. 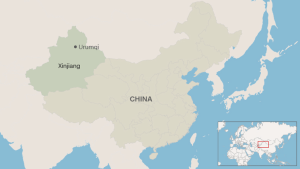 Tensions have arisen between Uyghurs and the Han, the predominant ethnic group in China, who have migrated to Xinjiang in large numbers over the past 60 years. A 2011 report by the US Congressional-Executive Commission on China said that Han workers have taken most of the new jobs and unemployment among Uyghurs is high. Activists say China has been taking measures to undermine the Uyghur language, culture and religious practices including restrictions on observing Ramadan. “We oppose the approach of linking terrorism with a certain ethnicity or a certain religion,” he added. Leibold said the government has been slowly increasing measures since July 2009, when some 200 people were killed in ethnic riots that were prompted by long-simmering resentment many Uyghurs have for the Han. Are there Uyghur terror groups? Beijing has blamed the violence on Islamic militants, led by the East Turkestan Islamic Movement (ETIM), which the US State Department listed as a terrorist organization in 2002 a year after the September 11 attacks. But many analysts dispute its characterization as an Al Qaeda or ISIS-style group. In February, a 28-minute video analyzed by the SITE Intelligence Group appeared to show Uyghur militants threatening to return to China to “shed blood like rivers.” SITE said it was produced by ISIS. 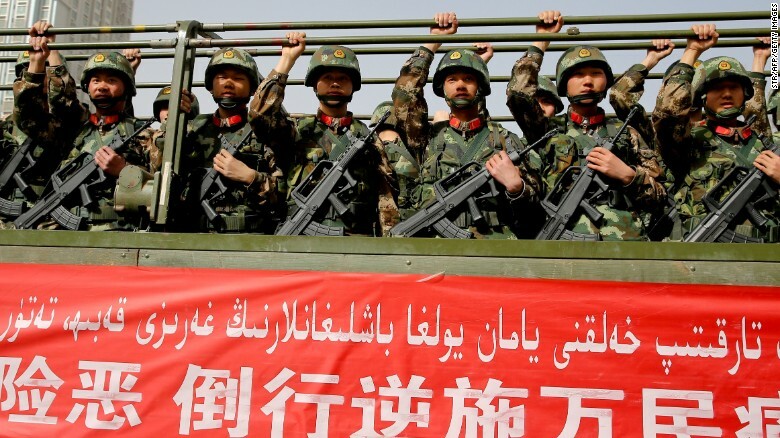 China has long asserted Uyghur fighters have joined the ranks of ISIS in Syria and Iraq. New America, a US think tank, estimates that 100 Uyghurs having gone abroad to fight for the ISIS cause, while the state-run Global Times put the figure at about 300. How do people in Xinjiang feel about this? 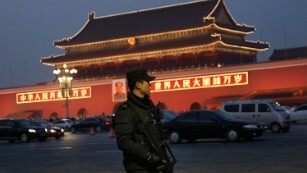 The Chinese government tightly controls access to the area. Journalists are closely monitored when in the province, and sometimes are prohibited from accessing certain parts of the region all together. The same applies for non governmental organizations. Leibold says the new security measures drive resentment underground and widens the gulf of misunderstanding and between the Chinese state and Uyghurs. “This is an example of a surveillance society that we’ve never seen across China,” he said. 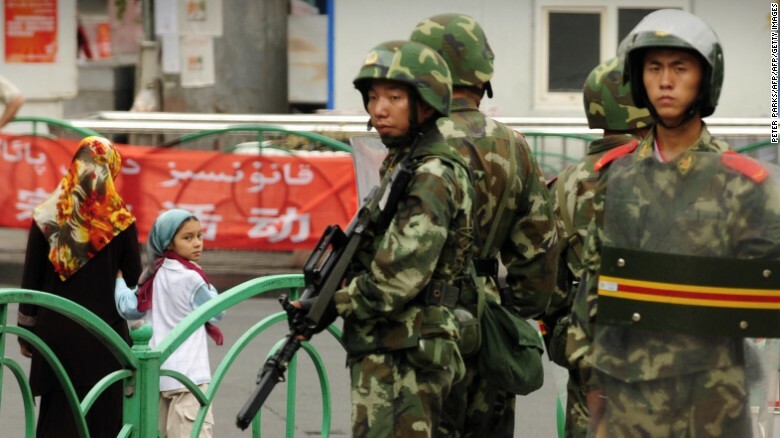 Chinese paramilitary policemen stand guard on a street in the Uyghur district of Urumqi city, Xinjiang, in July 2009. 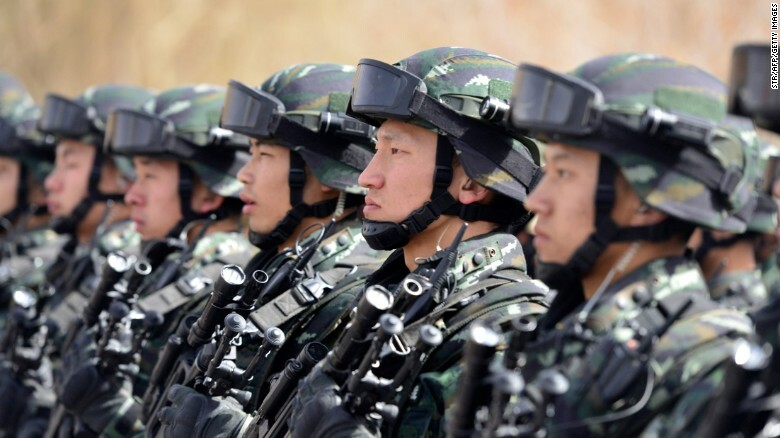 However, not all Xinjiang residents see Beijing’s security build-up as a problem. She said while she’s noticed a steady influx of ethnic Han Chinese move into the region over the years, but she hasn’t felt discriminated — either in the Chinese school she attended or in her job as a nurse. She added she didn’t mind attending the mandatory weekly flag raising ceremony, because it’s the same thing she did in school growing up, and thinks installing GPS in vehicles and other surveillance devices is for the greater good.